On Thursday, Oct. 14, 1971, police were called to respond to a man standing in the street and stopping traffic at Western Avenue and Romaine Street, between Melrose Avenue and Santa Monica Boulevard. The man had been living in a rented room nearby, at 904 N. Western Ave. The responding officer, LAPD Cpl. Myrl Thorne, reported finding a 67-year-old man in a disheveled condition, asking for mental assistance. The man said he had been a heavy drinker, but hadn’t had a drink in two days and was suffering from delirium tremens -- the DTs -- caused by alcohol withdrawal. The man was desperate for help, and hoped the police could assist him, even if that meant arresting him. Thorne reported that the man told him if he couldn't get mental help, "we could arrest him for some burglaries he had committed. Then he said he had killed a policeman back in 1927." 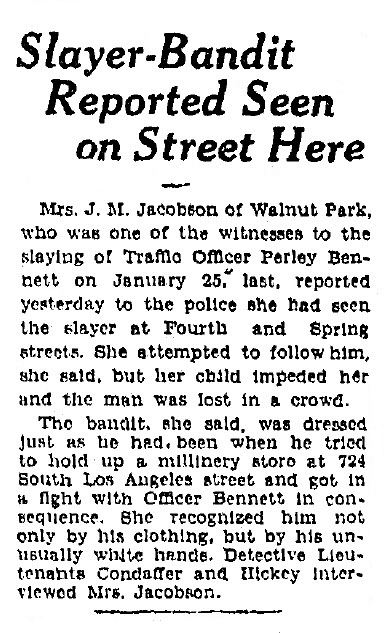 Nearly 45 years earlier, on Jan. 25, 1927, LAPD Officer Parley Bennett was working the traffic detail in downtown Los Angeles, at Seventh and Los Angeles streets, when an armed robber entered the Brodin Millinery Company at 724-26 South Los Angeles St. The gunman entered the building at about 6 p.m., just as employees were leaving at the end of their work shift. He pulled out a .38-caliber revolver, ordered the employees to move away with their hands raised, and approached the cashier’s window, where he demanded the day’s receipts from Charlotte Johnson, the company’s head bookkeeper, who was preparing to lock the money in the company safe. Johnson initially refused the gunman’s demands, and put the money in a cash box inside the safe. “If you lock that safe, I’ll kill you,” the gunman shouted as he followed Johnson to the safe. Johnson then raised her hands and backed away, but she continued to argue with the gunman, asking him to leave behind some company documents he had shoved into his pockets. While Johnson was keeping the gunman occupied, another employee, Ruth Werner, was able to slip away and run to the office of Arvid Brodin, the company president, and tell him about the robbery in progress. Brodin ran out of the building, found Officer Bennett directing traffic about a half-block away, and told him about the robbery. Bennett raced to the scene, and arrived at the front door just as the robber was backing out, with his gun pointed at the store employees. When the gunman saw Bennett, he quickly turned and fired three shots at the officer. Bennett was able to fire one shot before he fell at the entrance to the store, but missed his target. The robber stopped, grabbed the officer’s gun, and ran off down an alley along the side of the building, with $75 from the millinery shop. LAPD Officer Christopher Sheehan heard the shots and found Bennett in the doorway. Bennett was taken to the Central Receiving Hospital on First Street between Broadway and Hill Street, where he died of his injuries. Parley Leroy “Pat” Bennett was born March 11, 1894, in Fairview, Idaho, a tiny town on the banks of the Snake River, a few miles west of Pocatello, the third of four sons born to Samuel and Melinda Hibbert Bennett. The couple’s first child, James, died in infancy in 1891. Parley’s older brother, Thomas, was born in 1892, and his younger brother, Eugene, was born in 1896. Samuel Bennett died in 1900 at the age of 33, when Parley was 6 years old, and Melinda married Gustav Brauer, a Dutch-born farmer, in about 1906. In July 1918, 24-year-old Parley Bennett married 24-year-old Elizabeth “Betty” Rasmussen of Kilgore, Idaho, and moved with her to her hometown, about 150 miles north of Fairview, where he worked as a farmer. The couple’s first child, Kenneth, was born in Kilgore in August 1920. Their second child, Alice, died shortly after birth in July 1921. Meanwhile, Parley’s younger brother, Eugene, moved west, to California, where he found work as a fruit-picker in Fresno, then south to Los Angeles, where he joined the Los Angeles Police Department in about 1922. Parley and Elizabeth followed Eugene to Los Angeles, where the couple lived with Eugene on Oak Street near downtown. Parley worked briefly as a firefighter with the Los Angeles Fire Department before joining his younger brother on the LAPD on Aug. 1, 1924. Parley and Elizabeth Bennett’s third child, Enid, was born in Los Angeles in July 1923. Their fourth child, George, died two days after he was born in July 1925, and was buried at Evergreen Cemetery in Los Angeles. 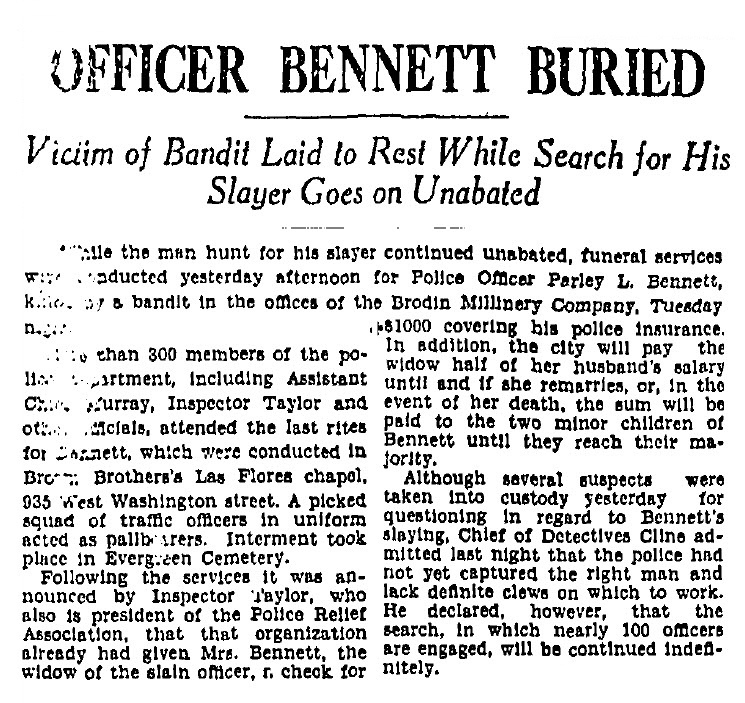 After Bennett's murder, 50 LAPD officers swarmed the downtown area, and searched every rooming house near the millinery shop for Bennett’s killer. The gunman was described as 25 to 30 years old, about 140 pounds, with dark hair, dark eyes, a square jaw and a sharp, pointed nose. Bennett’s killer was reportedly discovered that evening, hiding in a room on the sixth floor of a downtown hotel. A visitor from Omaha was staying at the hotel, and reported that he was unable to get into his room. The hotel detective and a bellboy entered the room from an adjoining suite. When the hotel detective opened the door to the bathroom, he found a man pointing a gun at him. The man backed out of the hotel room, and fled down a rear stairway. 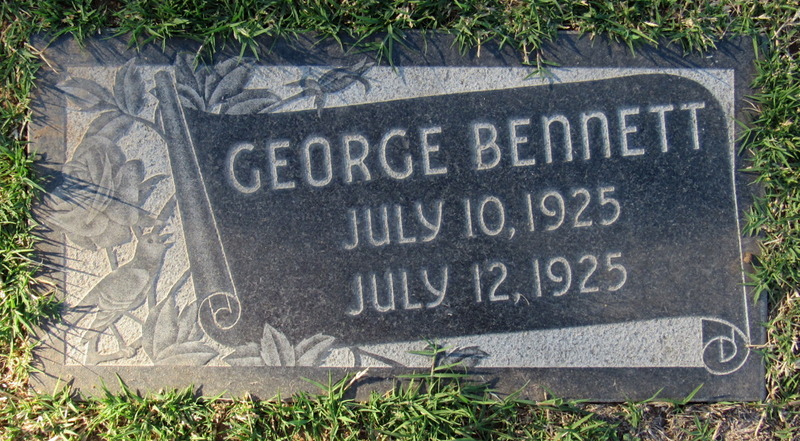 Officer Bennett was buried at Evergreen Cemetery, near his son, George. He left his widow, Betty, 33, and their two children -- Kenneth, 6, and Enid, 5. In spite of an extensive manhunt, involving nearly 100 LAPD officers, Bennett’s killer escaped capture. Hundreds of suspects, from San Diego to Bakersfield, were brought in for questioning, but Charlotte Johnson, the millinery company’s bookkeeper, was unable to positively identify any of them. Months passed, then years, then decades. Shortly after her husband’s murder, Betty Bennett and her children moved back to Idaho, where she worked as a schoolteacher near her hometown of Kilgore. By 1940, Betty moved in with her widowed mother, Annie Rasmussen, in Pocatello. In November 1950, Betty re-married, to Sherman Smith Halverson, a sheep rancher in Idaho. Betty died in 1982, at the age of 89. The Bennett children also remained in Idaho. Kenneth married Eileen English in 1948, worked as a rancher and a stone mason, and died in 1997, at the age of 76. Enid married William Hunter in 1943, worked as a schoolteacher for 23 years, and died in 2006, at the age of 83. The man who confessed in 1971 to Bennett’s murder was born in 1904 in Hartford, Connecticut. By the time he was 15, he was living at the Connecticut School for Boys, a reform school in Meriden, Connecticut. He later served a 15-year sentence in Texas after being convicted on charges of robbery and assault with intent to commit murder, and had a lengthy arrest record that included burglary, vagrancy and drunkenness. He was 23 at the time of Bennett’s murder, and fit the general physical description given by witnesses. During the man’s trial for Bennett's murder, a psychiatrist testified that she interviewed the man, and said he might have been having alcoholic hallucinations when he made his confession, which he recanted after his arrest. Nevertheless, after two days of deliberations, the jury found the man guilty of first-degree murder. At the man’s sentencing hearing in July 1972, three court-appointed psychiatrists testified that the man was mentally incompetent and could not understand the proceedings against him, although the issue of the man’s sanity was not raised before or during his trial. As a result of their testimony, Superior Court Judge David Fitts said he could not impose the mandatory sentence of life in prison. “Usually, the issue of whether a man is competent to understand the proceedings against him is a question settled before the trial or in a separate sanity trial,” said Deputy District Attorney Ronald Ross, who prosecuted the case. “This was not done in this case, thus we have a dilemma.” The option for the court was whether to commit the man to a mental institution, and for how long. The man never left the state hospital. 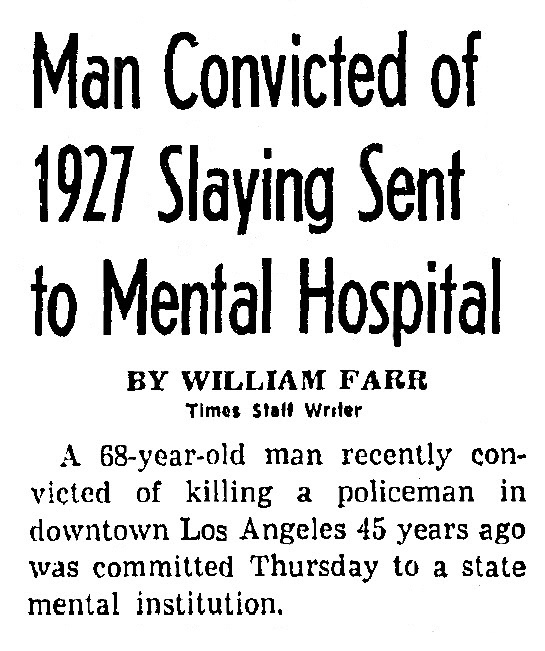 He died there on Oct. 13, 1976, at the age of 72 -- one day short of five years after his arrest. Officer Bennett's sign is located at on the east side of South Los Angeles Street, between 7th and 8th streets.